A worsening recent political divide within the leadership of the Sudan People’s Liberation Movement-North (SPLM-N, or “movement”), traditionally based in South Kordofan and Blue Nile (the “Two Areas”), is increasingly likely to lead to a change of leadership of the movement. Of grave concern, the political divide has already led to violent clashes with strong ethnic undertones between units of the movement’s armed wing (the Sudan People’s Liberation Army-North, the SPLA-N) in parts of Sudan’s Blue Nile state that are controlled by the movement and in camps hosting refugees from Blue Nile just across the border in South Sudan’s Upper Nile state. 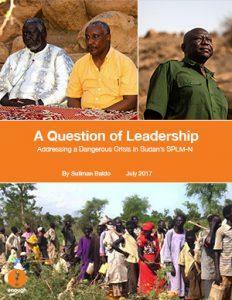 Preexisting ethnic tensions in this area have been exacerbated by the political divisions among top SPLM-N leaders. The leadership paralysis that is cited as both a cause and an effect of the current division, and the risks of further civil strife, are directly impeding the internal crisis and humanitarian response mechanisms, creating a dangerous transient leadership vacuum at the regional and local level. This vacuum is causing community leaders in areas controlled by the movement in Blue Nile state and in the refugee camps to pursue their own initiatives in an effort to calm their constituencies and reassure other nearby communities. While regional mediators and their international backers are ill-placed to mediate internal rifts within one party to the negotiations, they should communicate their concerns about the risks associated with such rifts to the leaders involved and impress upon them the need to avert the worst. Regional and international actors should engage constructively, not remain on the sidelines of this dispute or appear to be siding with one party or the other. Regional and international actors should actively encourage both sides of the SPLM-N divide to agree to address the worsening humanitarian situation in South Kordofan and Blue Nile and mitigate the real risks of escalating ethnic strife resulting from their differences through constructive and collaborative arrangements. Ultimately, no lasting solutions to the conflict in the Two Areas is achievable without the Sudanese government agreeing to end the historic economic and political marginalization of Sudan’s periphery regions and treating all of its citizens as equals. An opposition that is consumed by its own divisions has even less of a chance to press for such significant concessions from the autocratic regime of President Omar al-Bashir.